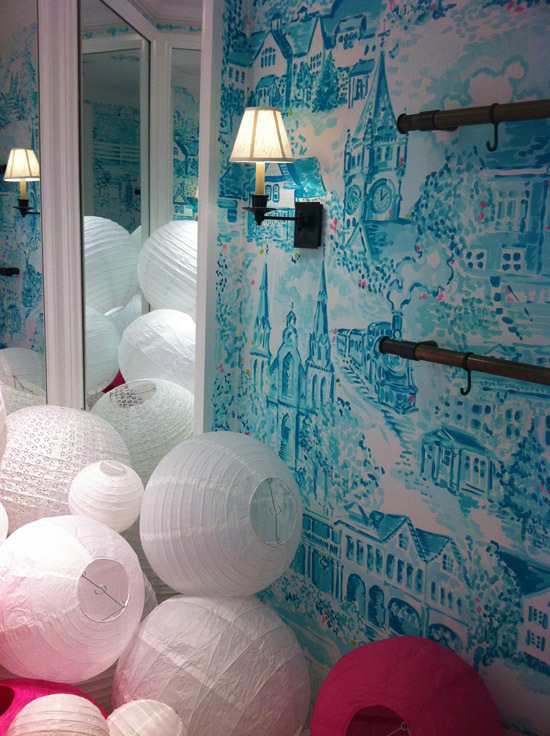 Last spring print designer Paige Smith painted a few of the Lilly Pullitzer stores across the U.S. and somehow I missed it! It's not a secret how much I'm loving toile right now - they go so well with all the florals we're seeing this season. So when I saw these walls I was in pattern heaven! I did a post on them over at Babble today if you're in the mood for a little toile inspiration. Check it out here! I'm really loving those paper lamps, too! I adore that wallpaper. Perfect for a bedroom. Whimsical, magical and beautiful! Now this should help me get over my toilet phobia! Just lovely..........a pleasure to pee in such environs. wall collage - inspire? I think so!